pp. 272, soft cover, DKK: 248, - illstr., facsims., maps, plans. The fifth and final volume of the impressive series on the historical and biblical Moses and which in quite a unique manner provides an interdisciplinary presentation of material from sources of religion, antiquity and ancient history. We all know Moses from the Old Testament as the person who liberated the Israelites from Egyptian captivity, and who gave the people in the desert the tablets with the Law of Moses. That he was so much more (a true Renaissance figure - in an all too modern expression) is in this volume rounded off with a characterization of Moses as a military strategist, and as architect, magician, astronomer, alchemist, legislator, philosopher, and the inventor of the alphabet. Almost a complete superman naturally admired by the writer who, however, also documents the sources thoroughly. Each chapter can stand alone and, as in the previous volumes, concentration and absorption may be required to maintain breadth of view. This is not a difficult, scientific text, but it is in its content rather compact and full of detail. It concludes with fifty pages of source references. The statements from renowned researchers and professionals on the cover and in the preface bear witness to the respect surrounding this work which is bordering on history and prehistory. The new and exciting information being available, introduces a current re-discovery of the amazing influence of Moses - from the troubled Middle East of the past till today's special conditions. also facts that can be referred to the somewhat storied figure we know as Moses from narratives and readings. Although this background is of great importance to our social life, we have barely realized it. Who was the real Moses? A new orientation - very unusual information - is presented to us by Ove von Spaeth, the Researcher and Writer, in his latest book, "Prophet and Unknown Genius" (subtitle, "Illuminating Moses the Advanced Pioneer"). The book presents controversial ancient texts, which have been handed down, concerning the oldest prophet and thinker of the Bible. According to the research of the sources of the tradition, Moses had a past as a highly educated Egyptian crown prince - and he established a dateless legislation. Later, however, it was attempted to deprive him of his also revolutionizing innovations. "... an impressive depiction of a man straddling the dividing line between history and prehistory and who according to this congenial depiction even created this line himself. - The sources as presented by the author ... enables the reader to span vast distances in time and argumentation. ..."
Based on the abundant but often unnoticed source material, it becomes clear that in Antiquity Moses appeared as a person with a versatile talent, known as prophet and legislator, as well as general, philosopher, astronomy expert, mystic, etc. The legislation of Moses - although this also includes some contemporary, normal cruel provisions - also presents surprisingly modern principles: laws on environments, and for social affairs, human rights, asylum, economic rehabilitation, protection of animals, hygiene provisions, and military ethics. And we see that law studies are not necessarily a mildewed affair. The three chapters of the book on the Mosaic Law are both thrilling and subtle. The entire book has been written at as rapid pace and in a fine and intelligible language - and is presented of much relevance and with many current parallels. When Moses laid down the Israelite calendar with 7-day weeks - unlike e.g. the Egyptian 10-day weeks calendar - by these provisions it was for the first time determined a weekly day of rest. It was expressed being ordered as a "human right". The ancient Rabbinical Writings also call the day "the gift of Moses". We also hear about his determination - 3,500 years ago - of calendar conditions like Easter and Whitsuntide. Later these, via Christian events, became increasingly important and are still parts of our calendar. Presently it is almost neglected that Moses also is showing relation to the invention of the alphabet, - although this was obvious to many ancient writers and Rabbinical Writings besides the Bible and later the Koran. Generally, the alphabet is dated to the times of Moses. It is distinguished from older writing systems, e.g. the hieroglyphs, by being mainly phonetic based and useable in all languages. The Bible was the first book in the world using the alphabet. Ove von Spaeth's absorbing tracing of the birth of the alphabet is pleasantly analytical and is also experienced as a fabulous expedition. Moses was the first known founder of a religion. The book also provides information on the Egyptian-Greek writer, Manetho, 280 BC, who had access to the famous Alexandria Library documents, which had been ordered to be collected in the very ancient Egyptian temple libraries. Manetho was thus able to inform that already prior to the Exodus from Egypt, Moses had presented a programme on religious reforms - and that his accession as head of the upheaval took place in the Lower Egyptian town of On, Heliopolis, "the City of he Sun". The Moses religion was naturally marked also by features of the past, but an important command was that "thou shalt love thy neighbour as thyself". Later, when Jesus was quoting Moses, this got its famous significance in Christianity. Today another still wide-spread feature of the Moses religion can be observed: the names like Adam, Abel, Eve, Jacob, Joseph and many more - these names are being used all over the world. All these personal names are from the biblical Moses Books. 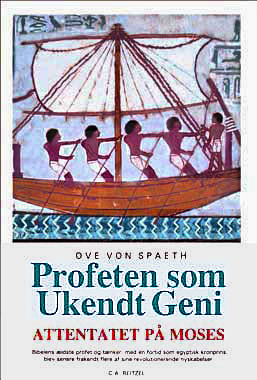 "Prophet and Unknown Genius" is the fifth of Ove von Spaeth's books about the exciting, displaced parts of the dramatic history of Moses (cf. www.moses-egypt.net). In these books it the first time such a huge material there is comprised from sources of Antiquity and ancient history on Moses and his activities. According to the epilogue of this fifth volume the intensive research required more than 20 years of studies including tracing and testing of materials and results. Nobody has ever written 5 books on Moses and his history - actually not even a 2-volume work is in existence. We can be proud of this monumental work - an international sensation. And I am privileged to recommend the volume, "Prophet and Unknown Genius", to everybody who wish a comprehensive presentation and a more logical-realistic picture of an in fact very exciting sequence of ancient history. When so comprehensive amounts of valuable information in this field are available, the sometimes extreme theoretical interpretation of the past executed by certain schools of research may seem absurd. In "Prophet and Unknown Genius", however, its writer Ove von Spaeth has realized that the task of history writing is to explain and to understand, and not to pronounce politically correct - and presently fashionable - sentences on history. How was it invented that Moses should be a myth? The book points out that "the scientific research, especially that established in the 19th century, has reacted in two opposite directions: either by moving around about the historically lately appeared "Moses stereotypes" with Moses as a Hebrew patriarch and a "shepherd figure" - or by rejecting altogether the historic existence of Moses. Not many, except the most fundamentalist circles, believe in a historical infallibility of the Bible. And in most recent times many groups among the "theorists of the writing table" gradually have had to abandon their non-historic myth ideas about Ur, the Hittites, Troy, and even Buddha, King Midas and many more - facing concrete and simply incontrovertible archaeological material of evidence. The present book of Ove von Spaeth is bound to convince about this being the time for seriously to give up the uncertified and unfounded myth ideas about the non-existence of Moses. The established knowledge suffers - of natural reasons - from huge gaps in research. In the light of much new material, some parts of the established knowledge on the past will often be incorrect. There are many angles, and all historians know that there is no authoritarian "belief" for a given historical sequence - not one unambiguous truth. According to this book, a lot is pointing to the fact that a number of original narratives about the early life of Moses, had been parted and divided. Some of these parts were being included in what we later have known as the Books of Moses. But other parts of the remaining material were existing along with the biblical texts - and eventually they were comprehended in the oldest of the Rabbinical "Talmud" Writings. It is from the information of these Rabbinical Writings that the works of Ove von Spaeth have extracted the concrete historical relevance. He points out coherence between Moses narratives from Egyptian, Greek, Roman, Jewish, and Christian writers and historians of Antiquity. This is for instance the case with Philo, the Philosopher of Alexandria, and Flavius Josephus, the Roman-Jewish Historian, former Priest and Officer. From Egyptian information contained in the world library of Alexandria, especially Philo had access to traditions about Moses, but had also drawn - like Josephus - on Rabbinical traditional knowledge. And Josephus informs us, that from Titus Flavius Vespasian Caesar, the Conqueror of Jerusalem, he had received scrolls taken from the temple at its destruction in 70 A.D. Approximately 10 years later Josephus started his great work about Jewish history. Parts of this work deal with events of the life of Moses. Historical monuments? As Ove von Spaeth points out - Moses never created a big empire, he never built a big metropolis, but he had a lot of influence on a considerable part of the world's cultural history - and not least, he contributed to an important base of western history of ideas. Therefore, he is important to us as background knowledge, too. And our writer of "Prophet and Unknown Genius" masters the art of information in an accessible and inspiring way about both the comprehensive material, and about the - at times - twisted ways of established research. Thus, according to this book, biblical research about Moses up till now has been stagnant, especially because of three main unsuccessful estimates: i.e. either that Moses is a myth figure, or that he should be dated very late, or that the Moses texts had been written by clerical writers 1,000 years after the time of Moses. It is impossible to deal with all the subjects of the book here. However, it is important that the book is focusing on several new orientating conditions of the old texts and points directly their coherent relations in ancient history. The tangibly exciting information now accessible by a big audience intensifies the consciousness on roots of our historical heritage and make them more vivid. Every close study of concrete personalities of the Old Testament will have to start with Moses, founder of Israel and the Israelite religion - and being the great inspiration of later prophets. Even in our modern times it makes a virtual impact on us that 3,500 years ago Moses was connected to conditions so impressive and surprising in our early historical and cultural heritage. In my view I should like to have some information about Moses presented as a person. According to the writer's preface that is not primarily the purpose of this book, however. Nevertheless, such wide-spread activities of a person might also to some extent be able to reflect the very person? This is where the reader will have to create his/her own images. Extraordinary discoveries have been presented - and a pleasantly thorough research. This one contributes to prove that it is possible - successfully - to put forward extraordinary demand for quality in the promoting of insight in a complex, ancient world and its history of culture. Also, the book is an intellectual achievement, which - across dividing borders of traditional schools - has been carried through as not only an especially valuable, but in fact an upheaval, expanded research. And in the same time it is a highly inspiring reading.